AZEK® Porch Flooring has eliminated virtually all the problems of both wood and composite porch floors. Made of Cellular PVC, AZEK® Porch Boards have the look, feel, and sound of premium wood porch decking and come with a lifetime limited warranty! With all these great features, AZEK® Porch Boards are by far your best choice in porch flooring. Over time it's also your least expensive choice! Tongue and groove installation with a slight crack between boards... just like wood porch flooring! Wood grain surface is almost impossible to distinguish from wood porch decking. Quantity discounts available. AZEK® Porch Flooring carrys a Lifetime Limited Warranty by AZEK® Building Products, the leader in Cellular PVC technology. With more than 20 years of experience in Cellular PVC manufacturing, AZEK® also makes AZEK® Deck, the best decking on the market. Together with AZEK® Porch Flooring, these high performance, low maintenance products have revolutionized the porch and decking industries! View a 5-part video series showing how one of our owners installed AZEK® Porch Boards on his own porch! Series starts with repairs to the porch foundation and ends with a beautiful, authentic-looking, lifetime porch floor. 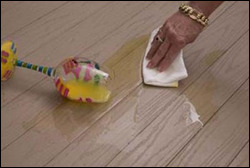 Almost all spills, such as the drink to the left can be taken care of with just a damp cloth. An added advantage of this special formulation: unlike some competing products containing polyethylene and wood fiber, AZEK® Porch can be used in covered or uncovered areas. AZEK® Porch Boards' proprietary embossing system creates one of the most aesthetically pleasing wood grain finishes in the industry. Attention to detail includes milling the tongue and groove joint so installed boards have a very slight gap between them. This mimics wood porch flooring to complete AZEK® Porch Boards' flawless simulation of wood porches. You'll enjoy the classic beauty of stained wood without the ongoing hassle of upkeep. This natural-looking wood grain finish provides the safety of a slip resistant surface while looking great! A strong, dense surface resists scratches from screws, tools and other gear during installation, so you can work with less worry. 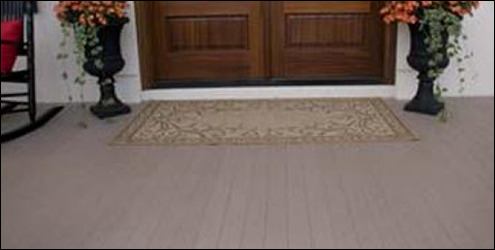 After installation, AZEK® Porch Flooring resists damage from everyday things like porch furniture, dog claws and general traffic wear patterns. 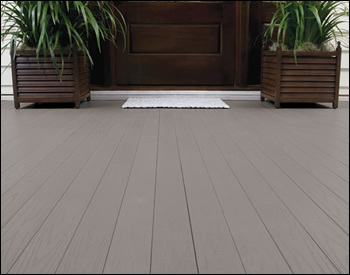 AZEK® Porch Flooring has the look, feel, and sound of wood. Installation is easy and uses the same tools as wood porch decking. But that's where the similarity ends! The long lasting color and enduring beauty of your AZEK® porch floor will still be getting compliments long after wood floors of similar age need replacing and composite materials are scratched and faded. Take the AZEK® Double Dare Challenge! 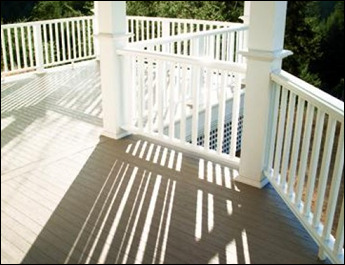 Prove for yourself that AZEK® Porch decking is your best solution now and for the future! Available in five colors. Compare AZEK® Porch Flooring to other wood and non-wood flooring materials and it's easy to see the difference. Thanks to Colorfast Solutions(tm) by Americhem, Inc., one of the industry's leading color experts, you get vibrant color that will hold up in the harshest climate and the hardest use. Click colors below for larger swatches or to order free samples. 1. 1" thick x 3-3/8" wide, including tongue. Installed width is approximately 3-3/16". 2. Actual length may be 1/4" shorter than listed but will be consistent for each shipment. 3. Lengths shorter than 10' are cut-to-order and not returnable unless defective.